Albuquerque, NM, February 19, 2010 – Marcie Davis was honored at yesterday’s 2010 Women of Influence Awards luncheon. The social entrepreneur was recognized for her work with Davis Innovations, Working Like Dogs, and Soulful Presence; as well as her longtime efforts to help other community organizations. Davis is a social entrepreneur dedicated to serving others. She utilizes both business and non-profit enterprises to reach out to underserved, marginalized and disadvantaged peoples. 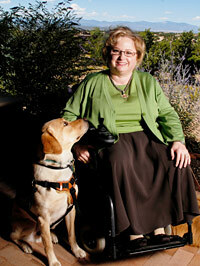 She has been a paraplegic for over 35 years and has been partnered with a service dog for over 16 years. Davis has never let her paraplegia get in the way of reaching her goal to help as many people as possible. Davis Innovations is based in Santa Fe and helps local and state government agencies, as well as nonprofit organizations better serve their target populations. Davis is CEO of the research and organizational development consulting firm which specializes in criminal justice, public health, disability, education and other social services. Working Like Dogs is an organization Davis founded as a resource for people wanting to know more about service dogs. She has written an award-winning book of the same name, and continues to create informative blogs and podcasts. Soulful Presence is a non-profit Davis began with a mission to empower underserved populations by creating awareness and advancing policy, research, education, and social action. Recently, Soulful Presence volunteers made a trip to Cameroon to deliver special locally made wheelchairs and other medical equipment to rural Tikar and Pygmy people with disabilities. Among other projects, the nonprofit has also instituted the Cissy Vargas Scholarship Fund to encourage graduates of Taos High School to complete their special education degree and to serve their community by giving back to others with intellectual disabilities. Beyond her socially responsible work with her company and nonprofits, Marcie also plays a leadership role as a member of the New Mexico State Council For Purchasing from Persons With Disabilities. She has spoken at conferences, such as the National Victims Crime Conference in October 2009, and is helping the Santa Fe Recovery Center create onsite housing for clients. These are just a few of her many socially responsible projects. The New Mexico Business Weekly 2010 Women of Influence Awards honored New Mexico women who have made a difference by being leaders in both business and community service. Professional achievements, contributions to the community and leadership skills were all evaluated. For more information contact: Ellen Cline at 505.247.3155.